Welcome to my web page. This site is dedicated to the full participation of children and youth with all kinds of abilities and disabilities in the communities where they live. I work with family members, professionals, policy makers, and advocates to promote quality and inclusive practices in Head Start, child care, before- and after-school care, youth programs, and recreational settings. Some of my work extends to adults as well. I have conducted evaluations, produced videotapes, and given keynote addresses featuring raps and song parodies. Whatever it takes! 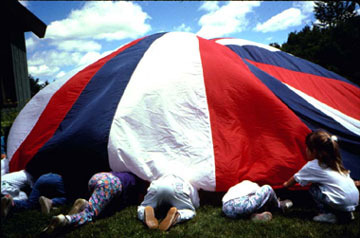 Why a photograph of children playing under a parachute? This active group of preschoolers included some with motor disabilities. The parachute activity met their therapeutic goals. However, it was fun for everyone, and the more typically developing peers never imagined they were involved in “clinical services.” This picture summarizes and symbolizes what I think we should be striving for when we talk about quality and inclusive programs: meeting individual needs in ways that make them fun and challenging for all kids, and that do not require the constant presence of specialists. Full participation is the theme of my book, Making a Place for Kids with Disabilities,which came out in spring 2000 from Praeger Publishers. In 2001 it came out in paperback. Learn more about my professional background and see a picture of me. Find out about keynote addresses and training I have presented. See pictures of kids collecting bugs and read an explanation of why that is my favorite inclusive and developmentally appropriate activity!